GeorgiaGirl wrote: I'm trying to find a high-output T5 system, but the cheapest I've found has been a set with a single 48" full spectrum agrosun T5 High Output Fluorescent tube. It costs about $60 (as opposed to sets I had been seeing on gardeners.com for $200+). Is that a reasonable price for a single-bulb system? (That's not just the bulb but the fixture, adjustment chain etc.) Or can I get T5 lights at Lowe's and rig up my own system for a lot less? A single bulb system would not provide enough lumens for your plants. 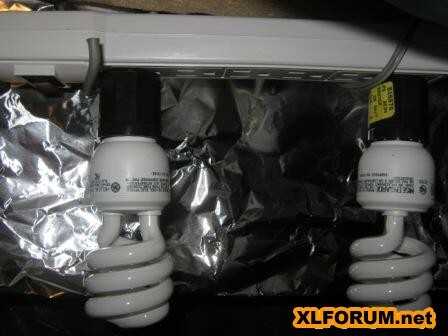 You need a dual bulb system at the least; 4-ft. preferably. The best price I've seen for such a unit was about $142. For the sacrifice of appearances, I bought the Tek light on yardlover.com - It was $187. If I had it to do over again, I would buy two of the $142 units. One for my seedlings and one for my mature plants. The seedling lamp would have two 6500k blue spectrum bulbs while the mature lamp would have one 6500k blue spectrum bulb and one 3000k red spectrum bulb. Reason being that flowering/fruiting plants require some red spectrum light to flower/fruit. If I remember correctly, the perfect rate is 9 (blue) to 1 (red). You won't be able to find comparable systems for cheaper prices at Lowe's. It is sad, but that is just how much these high-output systems cost nowadays. The bulbs themselves are an additional $10-15. Most companies that sell these units can switch up the bulbs spectrums for you if requested. Keep in mind that if you are not rearing your plants 100% indoors to maturity then a standard shop light fluorescent fixture (which are much cheaper than HO's) will suffice. 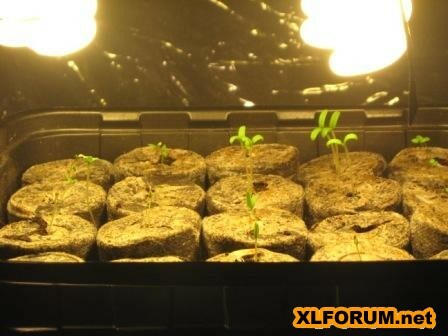 By using these, you can successfully grow seedlings indoors with decent, albeit weaker results. Re: Any Grow Light Suggestions? I'm going to start some plants indoors and I wanted to know what are the best grow lights out there. Are there any good ones out there under $50? This discussion is getting pretty far afield (and definitely much more expensive!) from what the OP requested: lights to start some plants indoors. I find no hint in the original post about needing intense heat/light/firepower throughout the season. Please tailor your responses to the OP's request. I thank EVERYONE for their posting ESPECIALLY when it got off track as the honest "mistake" (if it was a mistake) shed some light (LOL) on some really great info. resolutejc wrote: A single bulb system would not provide enough lumens for your plants. You need a dual bulb system at the least; 4-ft. preferably. The best price I've seen for such a unit was about $142. For the sacrifice of appearances, I bought the Tek light on yardlover.com - It was $187. If I had it to do over again, I would buy two of the $142 units. One for my seedlings and one for my mature plants. The seedling lamp would have two 6500k blue spectrum bulbs while the mature lamp would have one 6500k blue spectrum bulb and one 3000k red spectrum bulb. Reason being that flowering/fruiting plants require some red spectrum light to flower/fruit. If I remember correctly, the perfect rate is 9 (blue) to 1 (red). This is SUPER helpful... thank you. So, basically, assuming I want to START seedlings indoors (for transferring to an outdoor garden), I could use a standard shop fluorescent light, but a two-bulb high-output T5 system would produce stronger seedlings (better root system etc.)... right? Just so I'm understanding... is a single-bulb high-output system not good enough even for starting seedlings that will be transplanted outdoors? What do they sell a single-bulb system for then? I have a single tube 2' T5 "system" that I bought because I could get it for $25 off and no shipping. What I'm finding out is that the single tube doesn't light up sufficiently wide area to provide for a standard sized flat. The seedlings are all leaning toward the middle. 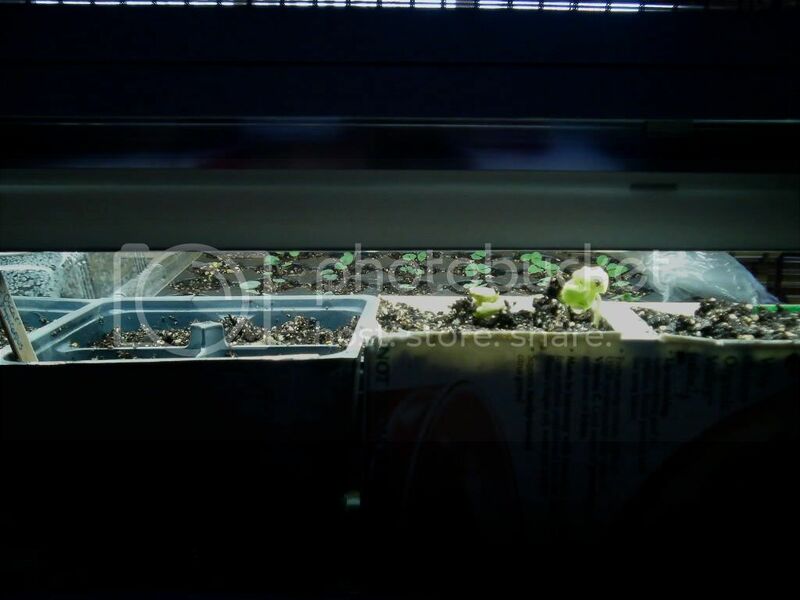 If I raise the tube any higher, the overall light exposure goes down and the seedlings start to get spindly. I just ordered a second reflector/fixture/tube set and I'm going to rig it so the two fixtures will be lighting the area. This actually may work out to my advantage because these 2 tubes will be somewhat more separated than a 2-tube unit. HOWEVER, if you're growing a row of 6 or 4 packs, the single tube unit will suffice. Standard shop lights (T12s) works just fine for growing healthy seedlings, and you can also shop T8's for price comparison. The key is adjusting the height of the lights and the plants so that top of the foliage are all at the same height (I prefer individual pots grouped in drip trays by seedling height, set on aluminum foil covered boxes for better light reflection (try it with and without and you'll see what I mean). Ahhh, that makes sense... thank you SO much!! Whatever is cheapest for you. T5's are not cheap. 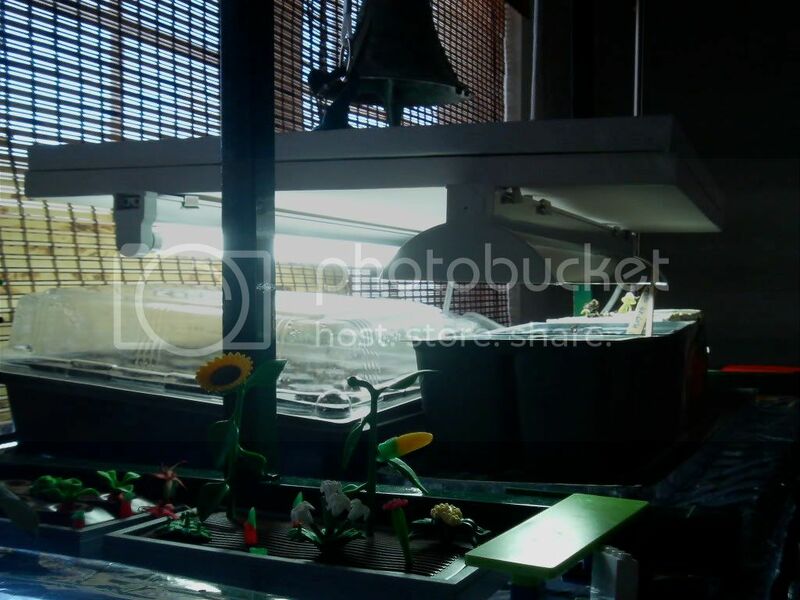 Multiple shop lights are sufficient for rearing seedlings. However, if you want them to last until maturity, choose T5's. I am using disposable aluminum lasagna pans as drip pans. Reflective and sturdy enough for hardening off when needed. Cheap too. That's a good idea Halfway. I have one too. I also reuse aluminum takeout pans. Of course just yesterday, I had one that started to leak as soon as I added water to bottom water. Luckily just one drip at a time. It was a pan that used to have a roast chicken or something in it and had a tiny hole where the knife poked through when cutting it up. I'm holding them up to the light before using as drip pan from now on They're useful just kept around plants and seedlings too. I have several propped up in my Mushroom Room (mushroom fruiting area) to reflect light for the light hungry Oyster Mushrooms and on the room-side of container plants trying to get as much of the weak winter sun as possible. You're right about the lasagna pan. It's much sturdier. applestar wrote: ...aluminum takeout pans. Of course just yesterday, I had one that started to leak as soon as I added water to bottom water. Luckily just one drip at a time. While we are on the subject of reflectors; after realizing that I could be in trouble growing my onions in window-light, I made a 1 ft. high wall of aluminum foil around the back and one side of the tray. Hopefully, this will help them get a little more light and grow a little straighter. Next year, will have to get another light. Ha, I haven't even got some of my plants started yet and I'm dreaming about next year. Time to slow down . My cheap "plug and play" setup. I have room to add another CF in the center of the strip should I need it. The lights are within my small indoor greenhouse that sets infront of my living room windows. I am hoping that with the combination of indirect sun and these lights I can keep my seedlings from getting legy. These bulbs are the cheap 60 Watt from the dollar store. I should know in a few days if they are strong enough. Results from this morning. Started rotating the tray today, hope to transplant into pots this weekend. Don't wait a few days. Your tomato seedlings are looking a bit leggy/spindly. I'm using 100W and 125W equivalents. Put in that 3rd bulb and move the trays up just a bit more, so the leaves are closer but not close enough to crisp, or change out the bulbs. If you can, get smaller trays and group the pellets according to sprout sizes. Put the short ones immediately below each light bulb, up higher and closer to the bulb so the newer sprouts won't be as leggy. The taller ones may lean since below the bulb is brightest, but you can compensate by turning them, and later burying the stem up to the seed leaves. Here's my rig. Now it handles one standard sized tray PLUS a row of 2 4-packs and a recycled OJ carton seedling flat. I needed something light weight to mount the two T5 fixtures on, and my eyes LIT upon a two pack of 20"x16" pre-made artists canvas (WITH corner braces -- not all of them come with those) that I had lying around in the garage. For those of you who are thinking "But, Applestar, you said you don't like the 72-cell seed starters" -- yeah, yeah. Do as I say, not as I do. These seeds all had similar germination days. Besides, salvias and begonias are bedding plants, and they're bred to germinate and grow all together. But lookee here, the begonias in the first 4 left rows STILL haven't shown a peep. I'm going to have trouble with them since the salvias are way ahead of them. With the new setup, the salvia seedlings are starting to straighten up. As I'm looking at it, I'm seeing that the big tray is going to have to sit up higher since the cotton seedlings just sprouting in the OJ container is obviously going to get much bigger. The 4-packs on the left contain tropical milkweed. I have them arranged this way because the milkweed and cotton were just emerging, but I'm putting them in the back soon and bringing the tray back to the front so I can take care of it, including rotating the tray daily, more easily. You can't really see them, but there are two hanging pot hooks on the top of the canvas that the rings for the cord for adjusting the light is attached to. It seems like a lot of people don't care for the 72-cell flats. I think that perhaps because they don't give the plants enough root space. If a plant gets root bound (can't do this with melons) you can loosen up the roots before planting, although I'll readily admit that this is not as good in growing them in a manner that they don't get root bound at all. I've planted store bought starts that seemed kind of tight in the roots, but they still grew fine. I'd like to pot-up to larger pots, but don't have the area or the lighting this year, so I'll see how things go with keeping them in the cells. I'm thinking that I'll at least do better than I did last year when I kept about 10+ plants to a communitarian container. End result? 2 in. pepper plants and tomatoes. On a bit of a side note: the 2-3 in. tomatoes grew great and bore fruit fairly well. The peppers on the other hand, bore only about two peppers (and that was at the end of the season ! Anyway, have a great gardening year, everyone ! Grow light vs. Basic Fluorescent 4' shop light?